Maryhill Crematorium has been in operation since 1895, one of the first in the UK and the first in Scotland. 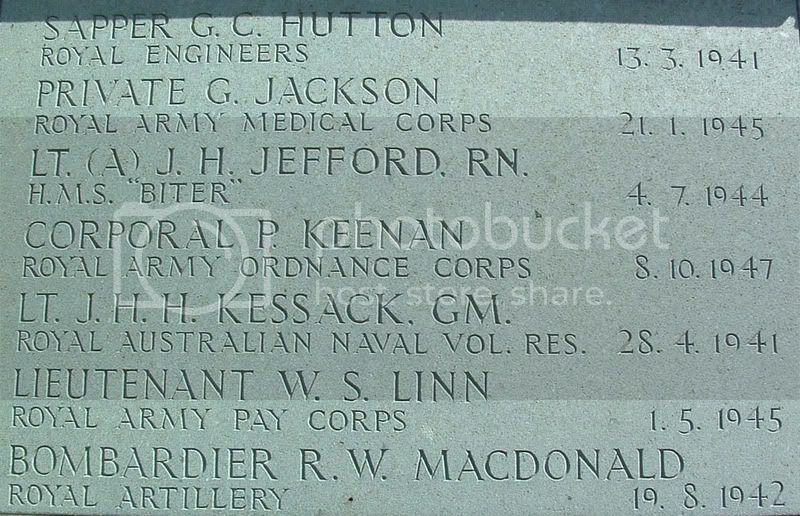 There is only one CWGC casualty listed for WW1 as being cremated there. 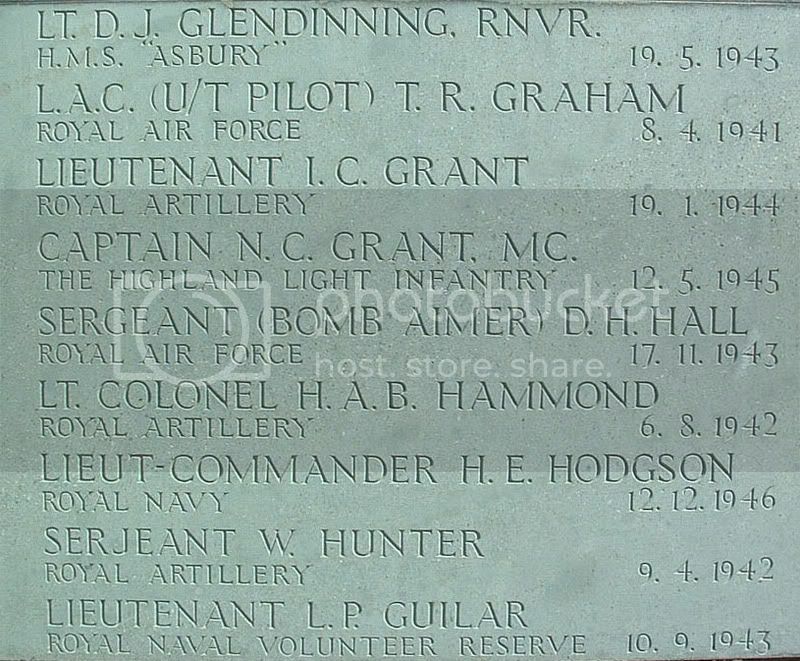 The CWGC Website lists that there are 74 Identified Casualties and there are 74 names listed on the main external panel, but it appears that there was also one man from WW1 whom I couldn't find any trace of. 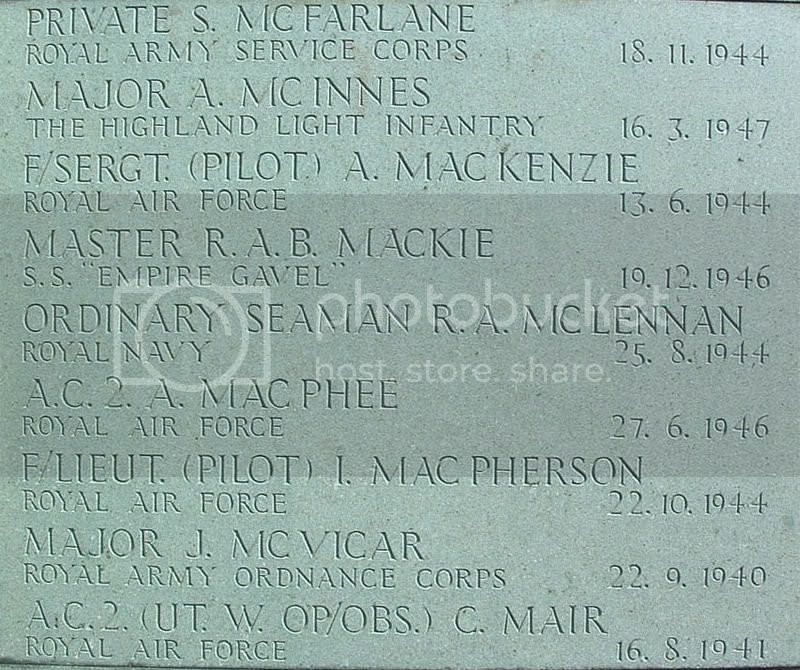 The 9 panels list the individuals alphabetically except for ther last two names at the bottom right hand panel. Inside a small room at the side of the garden housing the Book of Remembrance, I found another 4 plaques, two of them commemorating two of the men on the main panel, another who is commemorated at Tower Hill Memorial and lastly, one commemorating a whole family killed 13th March 1941. 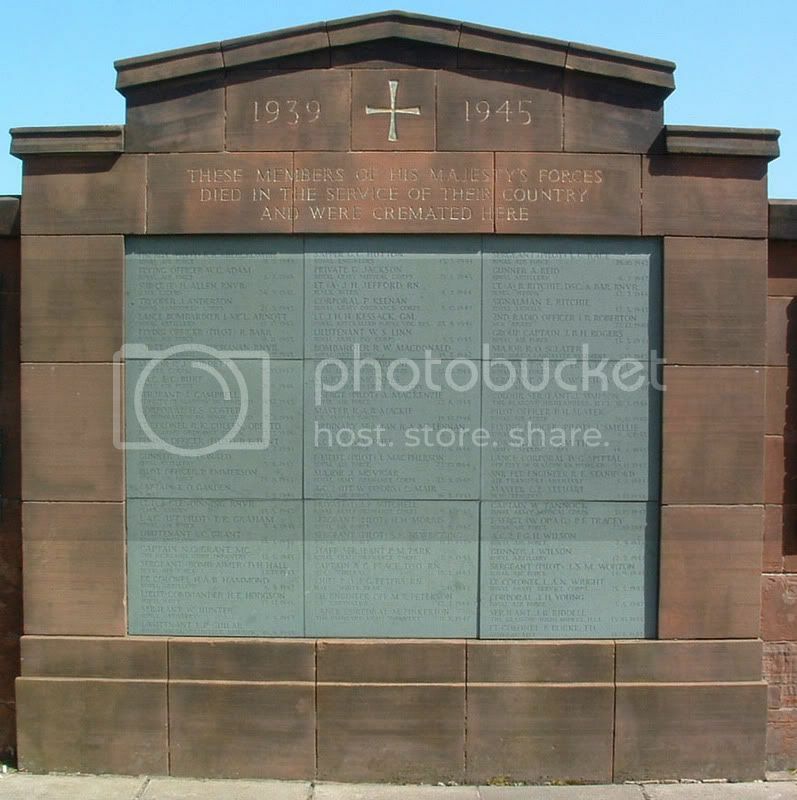 I will post all the photos (of the main memorial) at the beginning of this thread then add each person's CWGC listing alphabetically, each on a separate so if any point further info is discovered, it will be easier to edit. This section is on the opposite side of the garden to the 'Remembrance Room'. After having a chat with the Crematorium Supervisor, he very kindly offered to inform me if he comes across any other war related death not listed under CWGC. 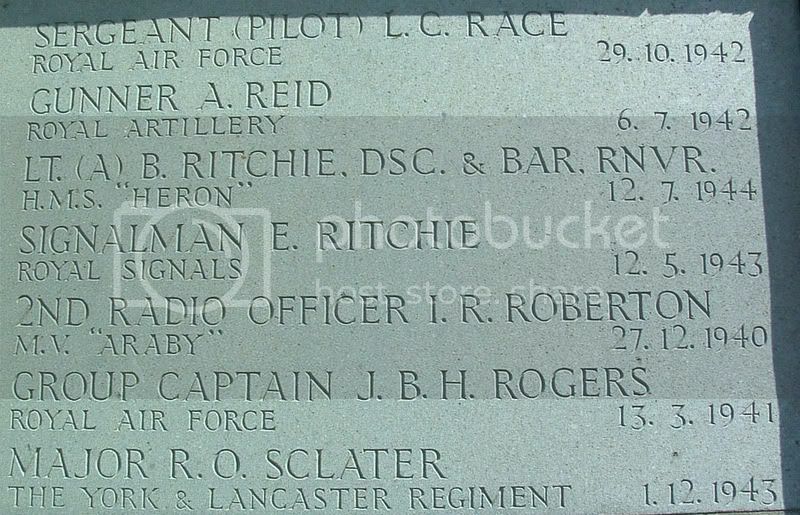 The following photographs are close-up's of the 9 panels making up the centre section of the WW2 Memorial. 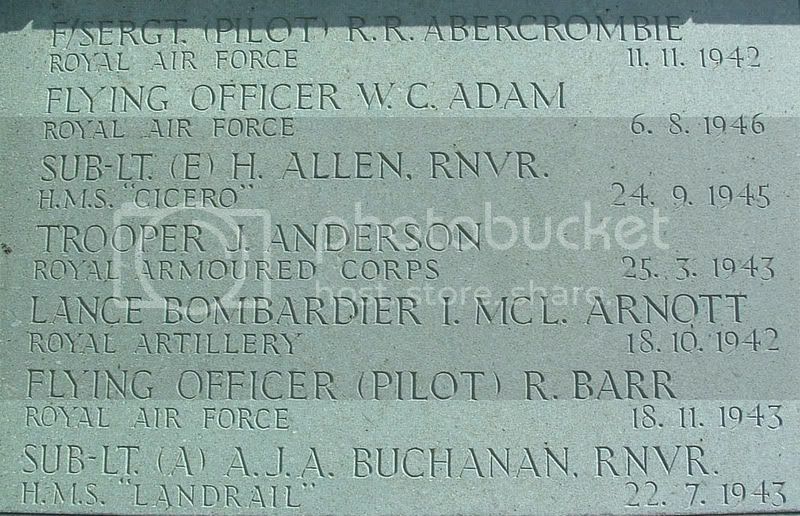 Additional information: Son of Dr. Robert H. Abercrombie, M.B., Ch.B., and Annie Ross Abercrombie, of Glasgow; husband of Wilma Young Abercrombie, of Glasgow. 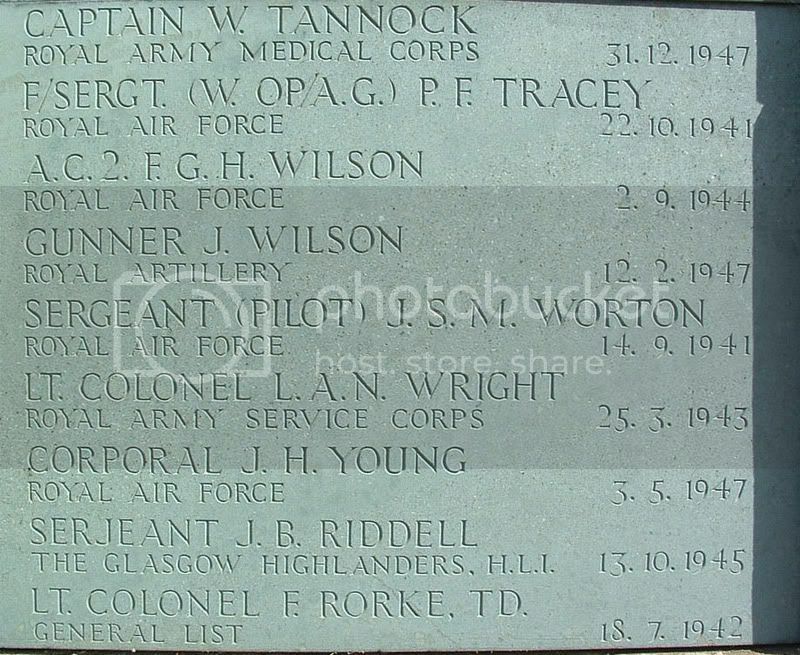 Additional information: Son of Henry and Elizabeth Allen; husband of Ann Allen, of Glasgow. 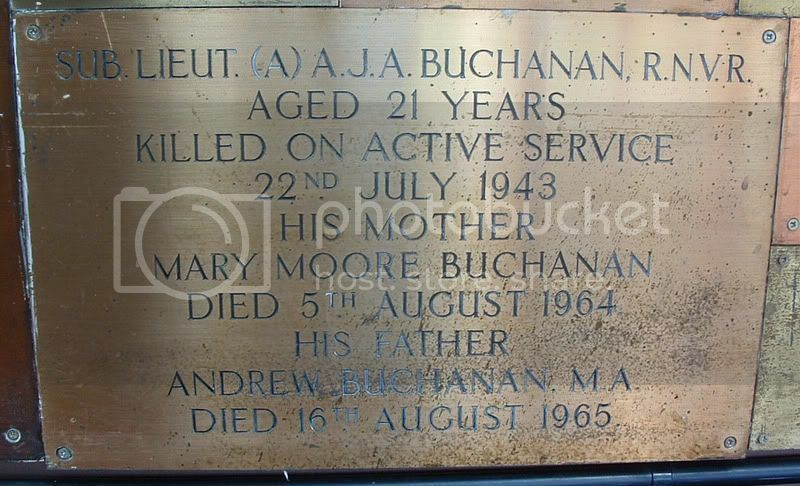 Additional information: Son of John Anderson, and of Marion Anderson, of Bishopbriggs, Glasgow. Unit Text: 421 Bty., 57 Searchlight Regt. Additional information: Son of John G. Arnott and Alexandra Arnott, of Glasgow; husband of Henrietta Clason Arnott, of Knightswood, Glasgow. Additional information: Son of Andrew and Mary Bunting Buchanan (nee Moore? ), of Hillhead, Glasgow. 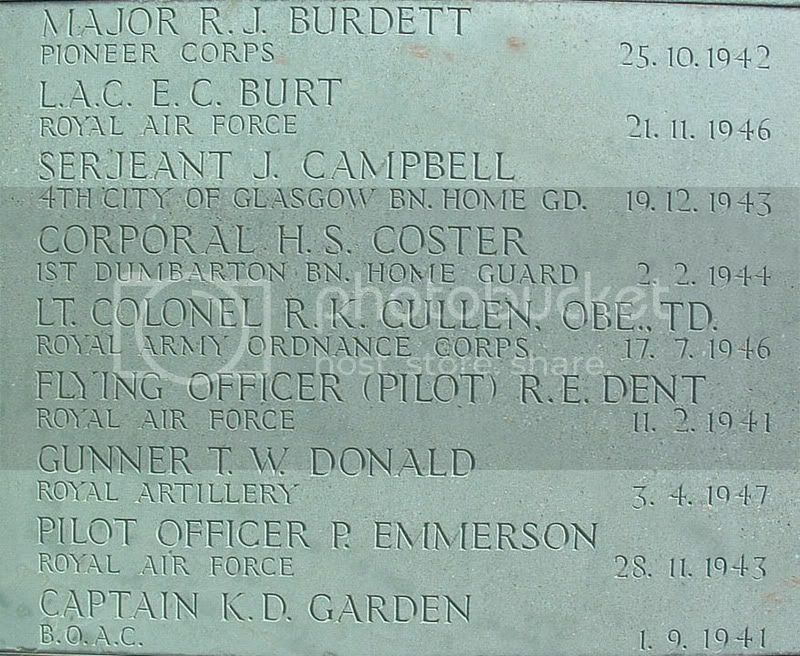 Additional information: Son of Robert McDonald Burt and Mary Wallace Callen Burt; husband of Jean Stevenson Burt, of Clydebank, Dunbartonshire. 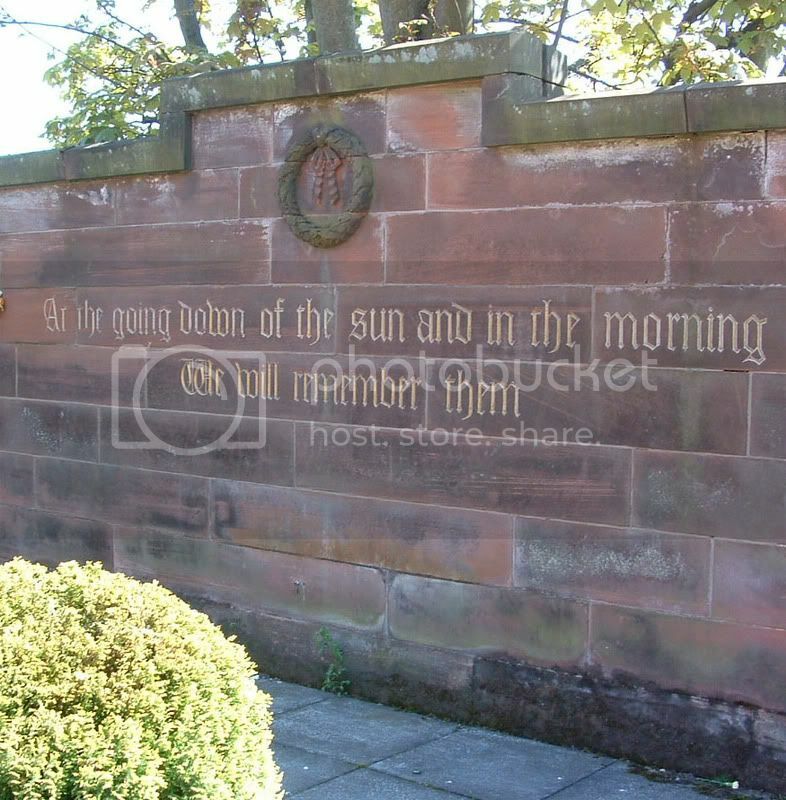 Unit Text: 4th City of Glasgow Bn. 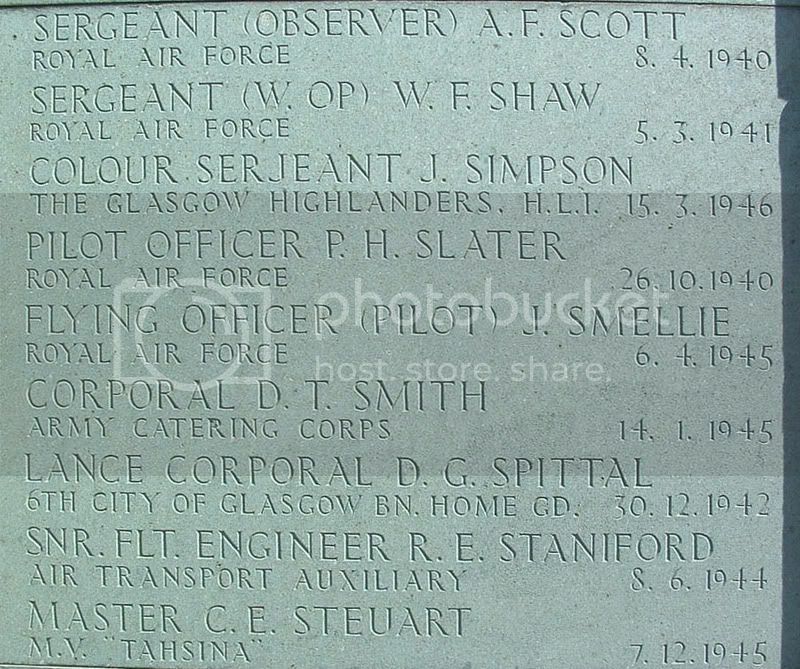 Additional information: Son of William F. Campbell and Grace Campbell, of Glasgow; husband of Lily Campbell, of Glasgow. Unit Text: 1st Dumbarton Bn. Additional information: Son of James and Amy Sophia Coster; husband of Alice Louise Coster, of Helensburgh, Dunbartonshire. Additional information: Son of Robert Kennedy Cullen and Agnes Watson Cullen; husband of Margaret Ramage Cullen, of Glasgow. 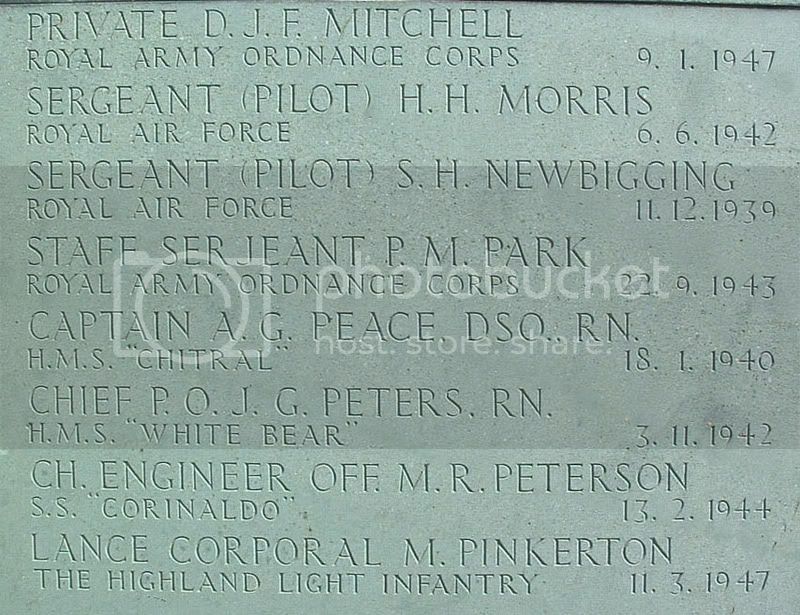 Additional information: Son of Admiral Douglas Lionel Dent, C.B., C.M.G., and Olive Kate Dent, of Aylmerton, Norfolk.